This is no relaxing river cruise – Sydney Harbour Jet Boating is all about the adrenaline rush! The jet boats, operated by Thunder Jet can seat 23 people and perform full 360 degree spins. 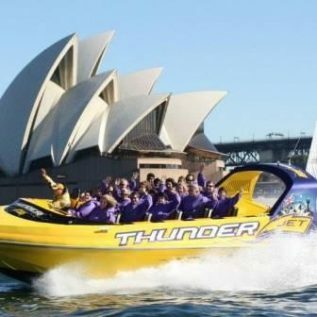 Not only will these exciting spins quicken your pulse, they’ll give you a full view of the Opera House, Harbour Islands, Watson’s Bay, Taronga Zoo, and Luna Park depending on which jet boat ride you choose. And you can enjoy the thrilling jet boat ride without a care in the world, knowing that Thunder Jet boats have the most modern, safe and advanced designs.